Black Cat Dust for Good Luck? Hoodoo and Conjure magazine seeks to bring information about Southern conjure practices that are little known, interesting traditions. Most folks have heard about the horrible practice of boiling a black cat alive in order to procure that one special bone that will render a person invisible, provide protection against black magic, or bring good luck, especially with regards to gambling. The Black Cat Bone was a most coveted bone by believers, and even today, there is a power and mystique associated with it due to the fact that its procurement involves such a taboo. Animal cruelty is not an acceptable activity, and while it was not considered such by practitioners in the past, it is in no uncertain terms considered cruel today. This taboo, along with the actual ritual itself, is believed to imbue the hoodoo with certain forbidden attributes gained by going through the actual experience of the ritual. But, there are many paths towards a similar destination, and perhaps the newer works created with a newer morality will prove to be just as powerful. 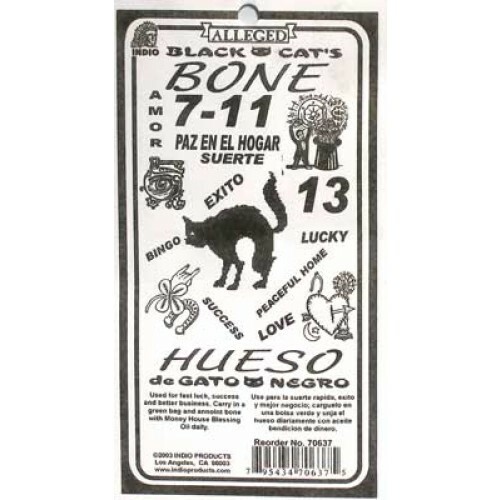 In addition to the special bone used for gambling, there was also the practice of killing a black cat in order to get a left front shoulder bone as an ingredient for a powder which was created to keep the law away. Called Black Cat Dust, this powder was believed to bring good luck in every area of life, from getting a job to making friends and keeping away enemies (Hyatt, 1978). How is Black Cat Dust Made? Black Cat Dust consisted of the powdered left front shoulder bone mixed with a ground up lodestone. The combination was then placed inside a bottle of Jockey Club Cologne and worn to attract luck. The technique for grinding both the lodestone and the black cat bone was similar – it involved grinding each back and forth using a window screen. Now, in the past, screens were undoubtedly made of sturdier material than today’s screens. To grind a bone to powder, Madrina Angelique suggests using a box grater. Heating up the bone makes it more brittle and easier to grate. She says it takes a long time to grind bones and that you have to take it real slow (Madrina Angelique, 2013, personal communication).